‘I first decided to experiment with using coarse black clay, following a visit to the home and studio of Miwa Kyusetsu X1, in Hagi, Japan in 1999. Miwa was a national living treasure so it was an extraordinary privilege to sit in his tea room and be shown three of his Chawan. I was struck by the beautiful snow-like whiteness of the shino glaze combined with dark, blackened bare patches on the body of the clay and enjoyed the harmony he had created between these contrasting materials. st decided to experiment with using coarse black clay, following a visit to the home and studio of Miwa Kyusetsu X1, in Hagi, Japan in 1999. Miwa was a national living treasure so it was an extraordinary privilege to sit in his tea room and be shown three of his Chawan. 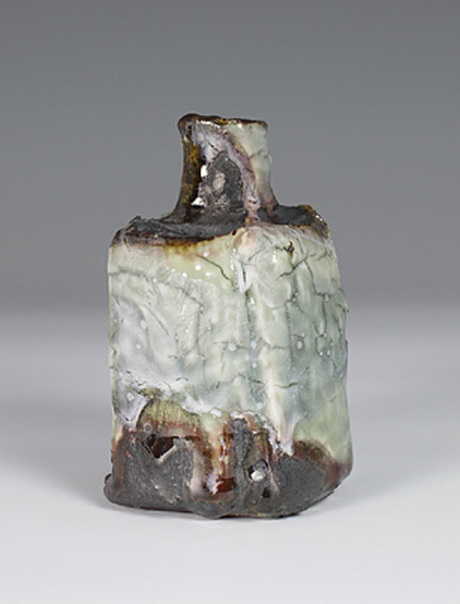 I was struck by the beautiful snow-like whiteness of the shino glaze combined with dark, blackened bare patches on the body of the clay and enjoyed the harmony he had created between these contrasting materials.